Overall, a good read, especially for fans of Lemony Snicket and his unique narration style. 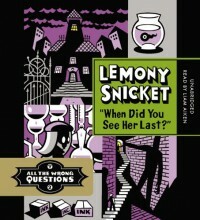 This book contains a new wrong question and a new mystery while continuing the larger scheme from the first book. It picks up right where the first book left off. There are more strange characters and new developments regarding Kit. It is a good mystery story. I didn't like this one as much as the first one. I can't quite put my finger on why, but I think this one dragged on a bit more than the first. I wanted it to move a bit quicker. The story was interesting, but it was a bit slow at times. Great artwork, as with the first book. And like the first book, the audio narration is well done. Good job, Original Klaus Baudelaire. Overall, a good read and I definitely want to continue the series, but it didn't live up to the excitement I felt reading the first book in the series. Can't wait to see what else Stain'd-by-the-Sea has in store for young Snicket.